The Swanky Swine | Making Change for young adults through education and employment. Making Change for young adults through education and employment. 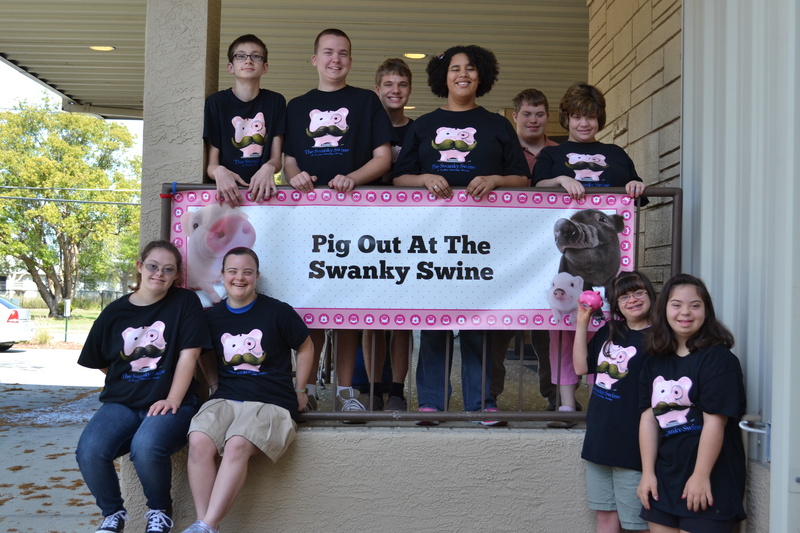 The Swanky Swine exists to educate, empower and employ young adults with developmental disabilities. We are a transition program at Woodlawn Community Academy in Clearwater, Florida. We make and sell drinks and snacks at our school store. We also have our catering license and offer catered lunches and baked goods to the public. 100% of our profits are used to develop the program and directly benefit our employees. Watch our recent news story on WFLA channel 8 below and be sure to follow us on Facebook and read our blog posts listed at the right to see our latest activities and updates! Our goal is that all of our students find a calling or career that will give them independence, a supportive community and a sense of purpose. We believe that employment (or vocational training) in a safe, sheltered environment will allow people with Asperger syndrome, Autism, Down syndrome and other disabilities to explore their unique potential and strengths. We were lucky enough to be featured on Fox’s Good Day Tampa Bay. Jennifer Epstein was awesome and their story was a great representation of our program. The story brought attention to the need for transition services for young adults with special needs. Support services and specific accommodations to allow them to become independent adults. We incorporate all of these elements into our transition program. Currently our employees are high school students. We hope to offer post-high school transitional services by the fall of 2014. For more information on sponsorship or enrollment please email us at theswankyswine@gmail.com. im glad i have this job too. Your school is awesome! I only hope this trend catches on and schools like this pop up all over the place. We need a school like this in Spring Hill, Floirda. Keep up the amazing work that you do as it makes a huge difference in the lives of so many children and their parents.